Text: Wakana Kawahito, which are constantly changing, along with the changing tides which can alter water levels by up to 5 metres each day. 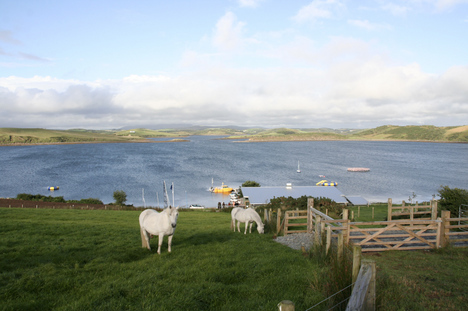 Inishturkbeg offers a wide range of activities to enjoy, from walking, sailing, fishing and horse riding, to simply reading books with a great glass of whiskey and taking in a spectacular view. The island started welcoming guests in June 2009 and can accommodate up to 36 in 6 separate buildings. The development was masterplanned by Andrew Wright, a former ‘Young Architect of the Year’, and all buildings have a modern, airy feel with the emphasis on comfort and relaxation. Two of the cottages also received the prestigious ‘Red Dot’ design award, in 2005. In 2009 saw the first Inishturkbeg Artists’ Week, involving 7 artists living on the island for one week and each producing a piece of work inspired by the experience, and the island philosophy of ‘life vividly lived’. This culminated in an exhibition in London before the works were taken back to the island for future visitors to enjoy. This will now be an annual event with the ultimate aim of producing a book of works spanning 10 years of art produced on Inishturkbeg. In 2010 the concept is also be stretched somewhat, from simply inspiring visual art, to including music, poetry, and perhaps even performance. For those people who want to experience Inishturkbeg’s unique spirit but are unable to visit the island, the team are now producing a range of products each touched by the island and imbued with the island philosophy of ‘life vividly lived’. A range of organic and free range smoked fish was exclusively launched in Harrods in 2009 in beautiful packaging showing just some of the intoxicating views from Inishturkbeg. The team is also in the process of developing a whiskey and considering a range of clothing jewellery and even health supplements in the future, all specially created to bring some of this magical island into the lives of many. Whilst Inishturkbeg would not be considered moderately priced, it does provide the incredible luxury of complete spiritual freedom, and that is surely an investment for yourself, isn’t it? Access: Inishturkbeg is just 20 minutes from Newport, 30 minutes from Westport and 50 minutes from Knock International Airport, which has flights from London Gatwick, Stansted, Luton, Birmingham, Manchester, Leeds Bradford, Liverpool, East Midlands, Bristol, Dublin and Cork. If you prefer something a little more exclusive, it is possible to fly privately to Knock by jet or even directly to the island by helicopter. If not using a helicopter, you can make the journey by car (approx. 50 minutes) followed by a 10 minute boat ride, all of which can be arranged by the island team.